Spectacle vivant en Bretagne is the Public Establishment for performing arts in Brittany, created by the Brittany Region and the French Ministry of Culture. 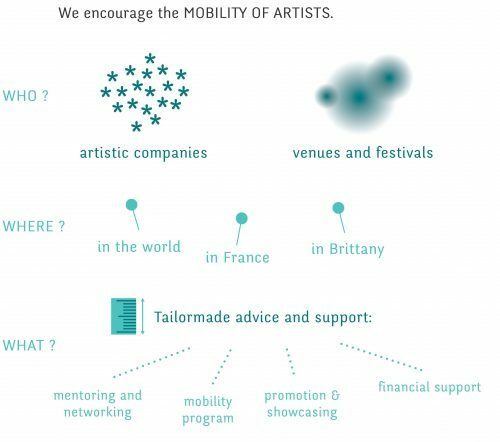 Since 2013, we encourage the mobility of Brittany’s professional artists engaged in performing arts and we promote the dissemination of their performances in France and abroad. We work with all performing arts fields : theater, dance, music, circus, street-arts, storytelling, puppetry, object-theater and all innovative mixed forms. We enable artists and companies from Brittany to build and fit into national and international touring networks. We contribute to formal qualification for professionals, disseminate art news, provide legal and technical advice, mindful of the social regulations operative in France. We fund touring. Our support is intended to share the financial risk incurred by a show or a concert that meets high artistic standards, that has overall development potentialities and that aims national and international networks. This expertise is the result of a collective decision. Cooperation platforms on an interregional, European and international level, are key elements of the development of artistic companies. This is why we have developped a specific partnership with ONDA (French office for contemporary performing arts circulation) and 4 other Regional Agencies for performing arts. We create international opportunities for artistic companies, develop cooperations’ and regularly invest in major events and professional markets, like Womex and Tanzmesse. We work closely with the French Institute and the French Bureauexport. We are an IETM member (International network for contemporary performing arts). Our partnership with the Relais Culture Europe (French Creative Europe Office) helps us to promote awareness on political issues at stake on the European level and their impact on the performing arts sector and European funds. Steering Committee; oversees our activity in order to make recommendations. Both groups are composed in majority of performing arts professionals. Furthermore, we link up with other sectors of activity, in particular from the private sector, as part of its forward-thinking stance as regards the future of the performing arts sector. Lastly, we are an active « EPCC– Public Establishment for Cultural Cooperation » committee member. A major player in new cultural public policy thinking, at a time when this special legal status opens up new possibilities in France. Partager la publication "I don’t speak French"